Exercise. It's a word we love to hate. But there's no way of escaping its importance in our all-too-sedentary lifestyles. Oh, the latest fad diet may promise you a size two body without having to cut back on your eating and without having to–you know–exercise. But no matter what nutritional breakthroughs they claim to have made, without exercise, you might just as well try a diet of only ice cream. But exercise doesn't have to be such a bugabear. The human body was designed to move around and do things. Our easy, sedentary lifestyles have made it difficult to take the plunge and actually start exercising. It requires work, hard work, to start exercising, and to keep going for any length of time. Once you do, however, something incredible starts to happen. 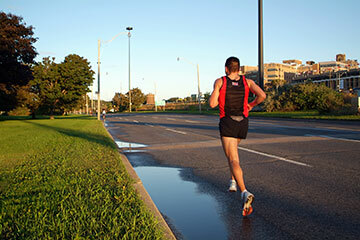 Have you ever watched a really fit jogger on the side of the road? They make it look so effortless...as if they were just floating. Then we try it ourselves, and inside of two minutes, we're panting and sweaty and wondering what's wrong with being fat, anyway. If we keep trying, however, doing a little more each day, for about a month or so, eventually something amazing happens. Our body realizes that this exercising stuff actually feels pretty good. The human body was made to move. You'll finish your exercise periods feeling tired, but in a good way. Your mind will be clear. You'll be able to focus better, and the demands of work and home won't seem quite as taxing. Getting started is the hard part. Consistency is the key; if you can just get started and keep going, then eventually, it will become almost effortless. If you give up, you'll just sink back into your sedentary lifestyle, and next time you try to exercise, it will be harder than ever.